Granted, one could discuss if wet and smelly socks are a nice compliment for a girl, but the fans of Mia loved her for this. There was even one customer who complained about the strong note of the socks. This never happened before and never after. Golden crown for Miss Mia! Besides her socks, Mia was a fantastic foot model. She loved the shootings and had so much fun with us. Unfortunately Mia moved and there was no chance to do anything more, so this wonderful girl is a golden history now. You will get three series in this Archive Pack. The first one is “Tanz der Nylorinas”. The title is a hommage to the German band “Mia” (haha). Brown leather flats with tan colored nylon socks were a very good choice for the first shooting. The second set is “Es rappelt im Karton”. I had a life-size portrait of Helge Schneider in my old corridor, which was a background for some of the photos. 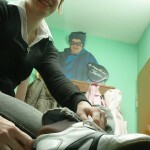 Mia wore white sneakers and black nylon socks, a much loved combination even today. 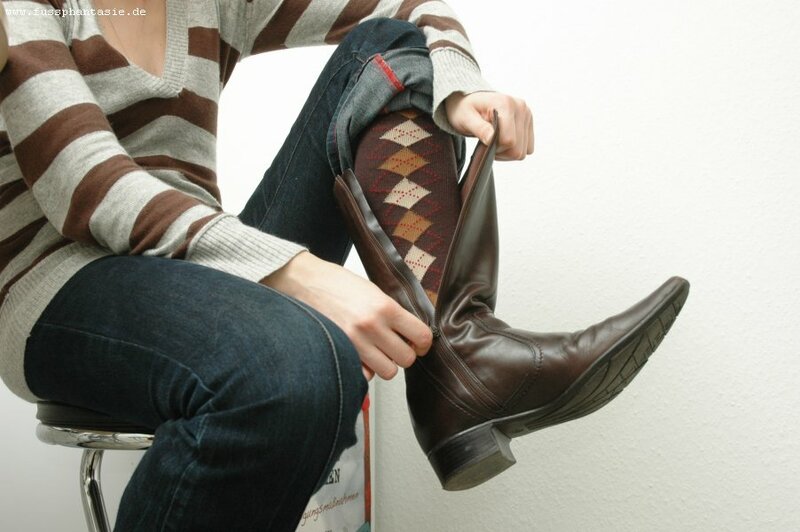 In the last series “Cowboy Junkies” we photographed brown Burlington knee socks with a kind of Cowboy boots in Mia’s kitchen.